FIVE REASONS TO VISIT OUR GLORIOUS ISLAND -- from Fodors! Vieques has been featured on New England’s nightly news channel “The Chronicle” on ABC /WCBV, with several very well produced segments! A Recent Review of VISTA DOS MARES from TripAdvisor! My partner and I visited Vieques with friends for 10 days and stayed at Vista dos Mares. It's an awesome property at the summit of hillside - with sweeping view to the Atlantic and Caribbean coasts. Its' a four bedroom house. This property is perfect for an extended family or multiple couples (that's us!) that want to share a rental. The home is wonderfully maintained, beautifully furnished and offers ah-ha views from every window. Each bedroom is large with its own bathroom and fully air conditioned, which is very nice for afternoon naps, but rarely needed given the wonderful breezes crossing the island. Two bedrooms on the main floor. Downstairs bedrooms are divided in one-bedroom and studio apartments - great for privacy and downtime. The remainder of the home is well laid out with a kitchen, dining and living area crossing the property. The kitchen features a full sized refrigerator, dishwasher, and is completely well equipped with everything you need. The multiple outdoor patios provide different lounging and dining options.. each with its own vantage point. We enjoyed breakfast with a Caribbean view and finishing up the day with sunset dinner poolside with mainland Puerto Rico sparkling in the distance. Vista dos Mares was the perfect place to quietly relax by day and entertain by night. We have a long history of cruising the Caribbean each winter and have rented in St. John for a number of seasons and without doubt, Vieques offers some the Caribbean's finest beaches - and they are only 5-10 minutes away from this house! And if you are not in the mood to cook, be sure to ask Andy for his restaurant recommendations. The island offers some of the best places to eat in the Caribbean (forget about cruise food!). There are lot of activities on the island too. Our group chartered a sail-boat (Vieques Classic Charter) for an sunset sail and had a fantastic time. There are a number of great galleries with local artists too. We brought home a few original pieces. Andy and manager Adrian do a great job of ensuring every detail is looked after. Perfect hosts. We would highly recommend staying here – We are hooked on Vieques. 2014 Traveler's Choice Awards of Islands in the Carribean! The glowing Mosquito Bay is a vision of bizarre beauty. Thanks to a bioluminescent microorganism, the water is a cool electric blue, looking somewhat like a fantastical sci-fi lagoon. Kayak or hop into a clear-bottomed pontoon boat to glide along the neon waters. 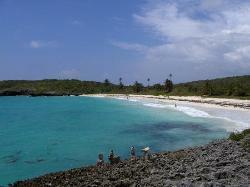 Swimmers and snorkelers will adore the pristine, undeveloped beaches. Keep an eye out for the playful feral horses that gallop along the dunes, or visit the stately ceiba tree that’s been keeping watch over the highland for three centuries. Another VDM guest review, this one from Flipkey, April 2013, which we are very happy to share! We stayed with family and friends at this very special place. The house is outfitted with everything you could possibly need. The views are amazing and from every angle, you feel completely isolated. Each room has a special feel and it is clear that the owners paid attention to every detail, so you feel relaxed and pampered. The location is high on Monte Santo, so the breeze is constant and in april it was just the perfect temperature to keep the windows open and comfortable. The pool is so spectacular you almost don't want to leave to explore some of the most amazing beaches to be found! We all love to eat, yet we never ate out for dinner because the kitchen had all the materials to pull off wonderful meals. We did have lunch at the "Sol" food truck outside of the Garcia Gate, which was delicious!! We were just disappointed that they are only open limited days. Do go down to the Pescaderia angelyz-near the ferry, and get some fresh spiny lobsters-you will have a meal to remember!! Vieques has been voted the best island in the Caribbean by readers of Travel+Leisure magazine. The ranking was part of the prestigious publication’s 2012 World’s Best Awards, which asked readers to vote on which hotels, destinations, and companies represent the very best in travel. The full results of the 17th annual awards are included in Travel+Leisure’s August issue. Vieques, one of Puerto Rico’s two offshore municipalities, was trailed by: Harbour Island, Bahamas; Virgin Gorda, British Virgin Islands; Grenadines, St. Vincent and the Grenadines; and St. John, U.S. Virgin Islands. The voting included the Bahamas and Bermuda in the Caribbean region. 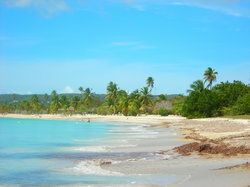 With a population of only 10,000 and just two notable towns — Isabel Segunda on the northern side of the island and the far smaller Esperanza on the south — visitors can expect plenty of elbow room on the unspoiled beaches of Vieques, which along with neighboring Culebra comprise the so-called Spanish Virgin Islands. The island town is 21 miles long and 3 miles wide, covering 52 square miles of area about 30 miles off the coast of Fajardo. Vieques derives its name from the Taíno Indian word for small island (biekes). Long a favorite of locals, Vieques has become a hot international tourism destination since the Navy abandoned its firing range and returned the military lands to the U.S. Fish & Wildlife Department in 2003. Vieques has always been a day trip and weekend destination for Puerto Ricans and intrepid tourists willing to rough it. But the departure of the Navy — which closed down a training base that took up two-thirds of the island’s acreage — led to a land rush as visitors bought vacation homes and set up bed-and-breakfast lodgings. The land rush settled down due to tight local building codes and the onset of recession. But the opening of the 150-room W resort, in what had been a Wyndham hotel, doubled the number of rooms available in the island and has been attracting a more upscale crowd. There is now air service by a half-dozen airlines making the 20-minute flight from both the international airport in San Juan and the regional airport in Isla Grande. The latest carrier to land on Vieques is St. Croix-based Seaborne Airlines, which began flights from Isla Grande in March 2010. Once on the island, tourists find Vieques still retains some of its frontier vibe. Wild horses roam and signs warn visitors away from beaches still being cleared of unexploded Navy ordnance. Some beaches still carry the code names assigned by the Navy during exercises, such as Punta Arenas (Green Beach), Playa Caracas (Red Beach) and Playa la Chiva (Blue Beach). While the roads to Blue and Red Beach have been paved recently, many fine secluded beaches are accessible via dirt roads that require all-terrain vehicles. Beyond the beaches, the island has low-key culture and nature attractions including a Spanish colonial fort in the capital of Isabel Segunda and the bioluminescent Mosquito Bay — considered one of the brightest in the world. A Review We are Proud to Share! Our family stayed 2 weeks at this fabulous home. Wendy (property manager) met us at airport and helped us to our car rental agency & to the property. The home was just as described. There was a very helpful book with pamphlets and business cards which detailed all area activities, restaurants, beaches, etc. The beds, baths, kitchen, pool were all well-stocked with all needed amenities. We did all the island activities including sailing with Marauder owner/crew Nate & Kevin, bio bay tour (Vieques Adventure-same Kevin on our tour), jet skis, eating/drinking and of course laying out by pool or visiting lovely area beaches. We even had massages by Ingrid Bergman at the property and she was fantastic! Very laid back and relaxing. Floating in a political no-man’s-land between US statehood and outright independence, Puerto Rico is an archipelago made up of four significant land masses, only three of which are inhabited: the heavily populated main island and its two eastern siblings, Vieques and Culebra. Divorced from the clamour and commercialism of the crowded “mainland”, the latter two islands – both reachable by a 90-minute boat ride from the port Fajardo – purposefully shun Puerto Rico’s default attractions of golf and gambling. The island’s lay claim to broad unblemished beaches, vigorous expat communities and a spirit of seditious nonconformity, borne in part out of the islands’ recent histories as firing ranges for the US Navy. By far the smaller of the two islands, Culebra is Puerto Rico at its most esoteric, an 11-sq-mile slice of sleepy eccentricity, where clucking hens wander down potholed side-streets, shops hang signs saying “open some days, closed others” and the nightlife begins and ends with a crowd of bearded Hemingway-look-a-likes at the waterside Dinghy Dock bar. Covering 52-sq-miles, Vieques plays Scotland to Culebra’s Wales. But, while larger and more heavily populated than its errant northern twin, its idiosyncrasies are gentler and a little easier to digest. 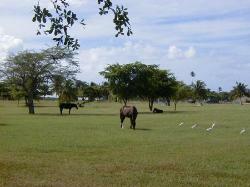 Wild horses rather than rare lizards pepper the grassy pastures, and a smattering of boutique accommodations have lent the two settlements of Isabel II and Esperanza an upmarket sheen. And the island’s refreshing dearth of traffic (or a single traffic light), makes it ideal for cycling. With more space and a better infrastructure, Vieques caters to a wider variety of tastes than Culebra. You can “slum it” in a quintessential Caribbean beach shack, or clink cocktail glasses at the W Retreat and Spa. The island also attracts families with its profusion of beaches (40 to Culebra’s half dozen) and safe road-rage-free streets that are eerily reminiscent of the US sixty years ago. Though soporific by “mainland” standards, Vieques retains a pulse after dark. Regular live music lights up sultry evenings in Esperanza and Isabel II. The pièce de résistance, however, is Vieques’ dramatic Bioluminescent Bay, an ethereal lagoon full of tiny micro-organisms which glow purplish-blue when disturbed after dark. The effect is rendered all the more psychedelic thanks to Vieques’ welcome lack of light pollution. Try kayaking the bay at night or taking a tour in a specially-designed electric boat. Vieques’ military occupation lasted three decades longer than Culebra’s, with prickly public protests finally sending the US Navy packing in 2003. But beneath the ongoing clean-up campaign hides an unusual blessing. Dozens of beaches that were inaccessible to the public during the military episode have since been commandeered by the US Fish and Wildlife Service, meaning they remain virgin and unsullied by resort development. Angling off the rarely-fished southern coast is phenomenal. We loved Vieques and your house. What a gorgeous spot with a million-dollar view!! We had so much fun roaming around the island checking everything out and the many hours we spent around the pool just relaxing. We travel quite a bit and love to check out new places but we would definatly return to Vieques and when we do we will absolutely stay at Vista Dos Mares. We also have told alot of friends about how much we enjoyed ourselves and will give a glowing recommendation for Vista Dos Mares!! Thanks for everything. We stayed at Vista Dos Mares for a week from July 15th-July 22nd. This was our third time on the island, but our first time in this house. For this trip we had family and friends with us, and our daughter, Maggie, who is 20 months old. Our whole experience was a fantastic, and we will definitely book this same property next year. The pictures and description were right on target, and the house and views are even more breath-taking in person. It had EVERYTHING we needed- including beach toys that my daughter LOVED (even more than the ones I bought and spent $40 to ship to the house). Beach chairs, towels, coolers, condiments in the fridge, satellite TV and Sirius radio, shampoo, citronella candles- it was all there. Another nice thing was that we had access to all the shows she watches at home through the satellite TV, so she could watch Sesame Street and her other shows when we wanted to relax and have some down time. The wireless internet was fast and consistent- this made my hubby happy, as he could keep up with his fantasy baseball. Wendy, the property manager, was so helpful; she connected us with a rental place for the pack and play and car seat (Patty at "Nu to You"), recommended a place to stay the night before our rental started (Casa de Amistad- Julie was so sweet and the place was clean, cute and so cheap), and she helped us find a chef to make dinner for our first night (Zach in Vieques made a DELICIOUS meal- the mango sorbet and salsa were super yummy), and the babysitter we hired- Christine (she was sweet and professional, and even though I did not think I would be comfortable with having a complete stranger watch our daughter, my fears were at rest once I met Christine). There were a few plumbing issues when we were there, and Wendy had someone out immediately to take care of them. The best part of vacation was seeing how much our daughter enjoyed it. The house was so perfect- there was plenty of room to set her pack and play in our room. It was windy when we were there, so most of her days were spent with Daddy in the pool. The pool could not have been any more perfect for us. There are two levels, as shown in the picture, and a deeper part. The shallow parts were perfect for Maggie to "swim" around in and play with her toys. She spent hours upon hours in the pool. The set-up was so nice; we could watch her while we swam in the deeper part, or sat in the chairs and relaxed, but we didn't have to hold her. We will be back. Vista Dos Mares renovations enhance the downstairs apartment! We have renovated Vista Dos Mares’ private entrance one-bedroom apartment. An enlarged modern bathroom with a new curved and spacious shower for two, has a unique hand-painted glass bowl sink, cool fixtures, plus, a new, efficient kitchette. And, to boot, we’ve installed brand new louvered windows throughout the lower level making the studio and 1-bedroom apartments more bright, airy and open to the view. Here are some photos. Come on down to Vista Dos Mares. We’re making your home-away-from-home even better! “...It may have been after my second screwdriver, and it was definitely after I had eaten a few bites of the Viequense breakfast at Bili’s on the malecon in Esperanza, that I uttered the memorable line..."